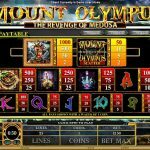 Mount Olympus Revenge Of Medusa is a great video slot game coming from Microgaming. 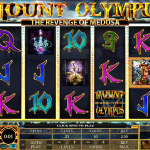 As the name suggest the slot has an Ancient Greek theme with Medusa in the spot light. The story of Medusa is well known so you better look away from her glare if you don’t want to be turned to stone. The game has decent animations and great symbol details. The overall tone of the slot is dark which perfectly fits the game theme. The most attractive part of the game is the great free spins bonus which is sure to catch your attention. The wild symbol can land on all of the reels and will substitute for all of the game symbols except the scatter symbol. He doesn’t offer any payout itself, but will double any payout he contributes in. The scatter symbol can land on all reels and awards a top prize of 50 x stake. Once three or more scatters land on the screen the free spins bonus will be triggered. The player will get only 5 free spins. Before each spin starts you will need to pick one out of 5 snakes. Each snake will award anywhere from 1 to 4 wild reels on the screen for the following spin. Because of the double function of the wild, players stand to win payouts of over 50.000 coins in a single spin during the bonus feature. 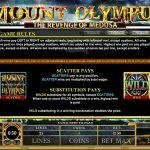 Mount Olympus Revenge Of Medusa is a great Microgaming slot which didn’t become too popular for some reason. The game has attractive visual details and an interesting theme, along with a great bonus feature. All you need is some luck in the free spins bonus to guess the right snake and you can end up with 4 wild reels on the screen. This is a big payout in any video slot game. Sometimes all you need is a bit of moonshine to get a better perspective of things. If you agree then you should consider playing Moonshine a 5 reel slot by MicroGaming.